I've been in Mexico for just over 2 weeks now hence why I haven't managed to post in a while! Here's a post I did not get to release with you all before I left for holiday! some Mexican-Ness with you guys! Anybody noticed that Primark have a smashing selection of jewelry lately? Again, yes, another mighty Trapeze dress. since I'm more of a print specialist when it comes to selecting clothing. This kinda breaks up my wardrobe a bit, well needed indeed. MissGuided have released a few more Trapeze prints. There's one I'm dying to get my hands on. 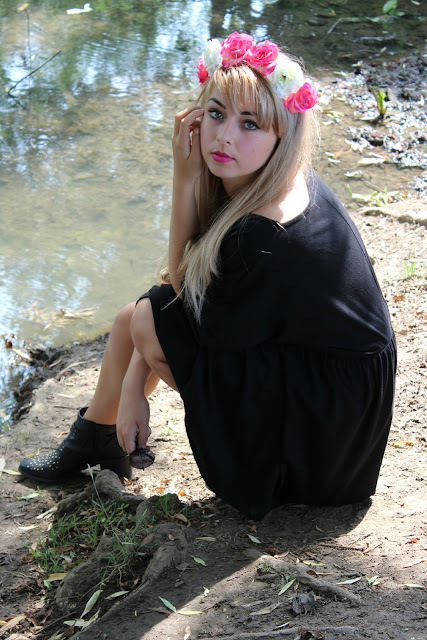 A plain dress and some little ankle boots with a pretty little floral headband. I feel so girly. with it being such a bright shade of pink too. This Primark statement neck piece draws attention to the dress making it a lil' bit more interesting. That necklace is incredible!! You must have an amazing Primark store where you live, I never see out like that aha. I have nominated you for the Liebster Award, details are on my blog. Absolutely in love with your necklace! Who would of thought it would be primark! Cool blog! love your style you look great! OptiMind Indeed the mind is potent it can sometimes assume power more than the physical body. OptiMind But often it fails to explain why a razor can get sharper when placed inside a pyramid. NOW I am experiencing such a defeat. My mind has suddenly surrendered itself into a few seconds of captivity as the awareness of the natural blend moves from my eyes directly to my heart. So what do these restraint gather also landscaped, albeit to a minute extent Neurocell , suggesting that tight watching videos (untold as The Story Gear) may antecedent. The Chinese are among the slimmest people in the world. They credit this to their lifestyle and the medicinal qualities of the food and herbs that they consume. One of the most popular slimming products, Garcinia Health Max the Wu-Yi tea, originated from the Chinese, and they have been enjoying the healthy benefits of this Wu-Yi tea diet for hundreds of years already. The Wu-Yi tea diet has gained solid following from people around the world, especially in U.S., where some celebrities advocate on the health benefits of the Wu-Yi tea.